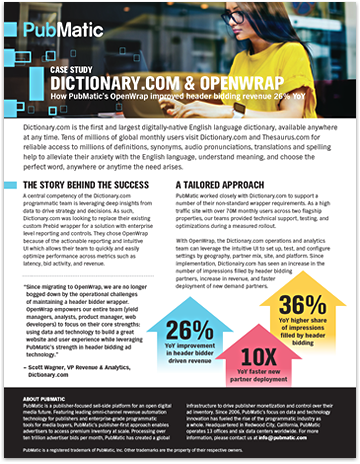 Dictionary.com is the first and largest digitally-native English language dictionary, available anywhere at any time. Tens of millions of global monthly users visit Dictionary.com and Thesaurus.com for reliable access to millions of definitions, synonyms, audio pronunciations, translations and spelling. A central competency of the Dictionary.com programmatic team is leveraging deep insights from data to drive strategy and decisions. As such, Dictionary.com was looking to replace their existing custom Prebid wrapper for a solution with enterprise level reporting and controls. They chose OpenWrap because of the actionable reporting and intuitive UI which allows their team to quickly and easily optimize performance across metrics such as latency, bid activity, and revenue. With PubMatic, Dictionary.com experienced a 26 percent YOY improvement in header bidding revenue and 36 percent higher share of impressions filled by header bidding. Learn how in this case study.